My hands down favorite spring flower is the tulip. (Sorry daffodil - you are a close second!) I've had zero luck with them growing in my yard - something keeps eating the bulbs. 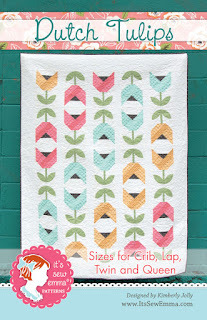 Making a tulip quilt is the next best way to enjoy my favorite flower! I just love this pattern! The pattern is called Dutch Tulips and can be found at Fat Quarter Shop. I used American Made Brand solids sourced from Fat Quarter Shop to make my wall hanging. Before hanging the quilt on the kitchen wall, we took a road trip to a park for some fun photos! It was a beautiful day - a picnic or a canoe ride on the lake would have been a perfect park activity! It was fun to do needle-turned applique process for the leaves. I enjoyed the pattern so much that I down-sized it just a bit to make a table runner which finished 12 x 32''. 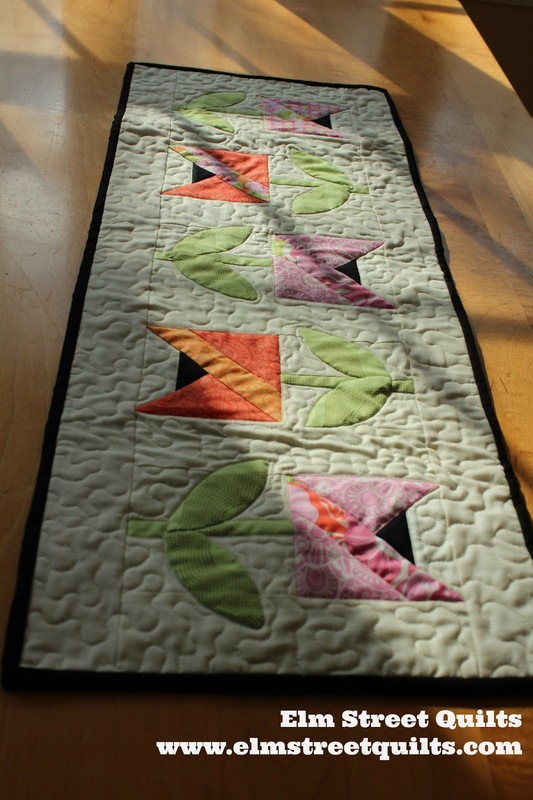 For this runner, I kept the leaves the same size and made the flowers smaller. The table runner users scraps of an older Kate Spain line. This one is off in the mail as a gift. Each of these were quilted the same way - first stitched around each flower to outline and then used some matching thread to stitch in the some areas on the tulip and the leaves. For the background, I just did a basic large stipple. Find more information about Dutch Tulips on today's Jolly Jabber blog. There are other bloggers making tulip quilts as well - check it out! Pretty, huh? Still feel like making another one! 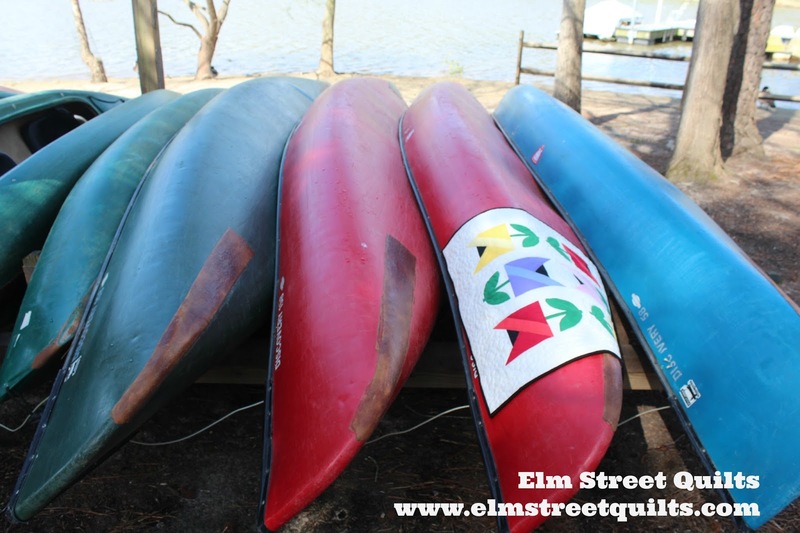 My two tulip quilts will be linked up with Freemotion by the River, WIP Wednesday's, Let's Bee Social, Midweek Makers. Finish it Up Friday and Finished or Not Friday. My tulip quilts are finish #15 and 16 for 2017 - many of these (but not all) are minis. So pretty. I love the tulip quilts. Colorful and cheery. So pretty...I love tulips! Great photo road trip! Those are the prettiest tulips I've seen in a long time :) I love the table runner too. Going to the park was a great idea for the photos. Ah, yes...I am a tulip lover and foiled tulip grower as well. For us - it is squirrels who eat the bulbs. They are careful to dig them up and take only one bite but the damage is done. Your quilty flowers are beautiful. 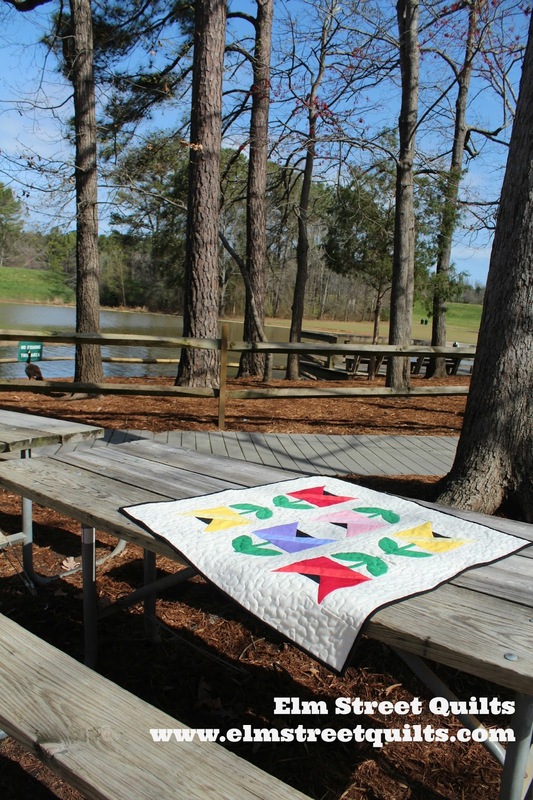 Beautiful quilt and table runner Patty! Really love this Patty! The bright tulips just pop like they do in the garden! I like your twist on the pattern! Great job... and the photo shoot is beautiful! 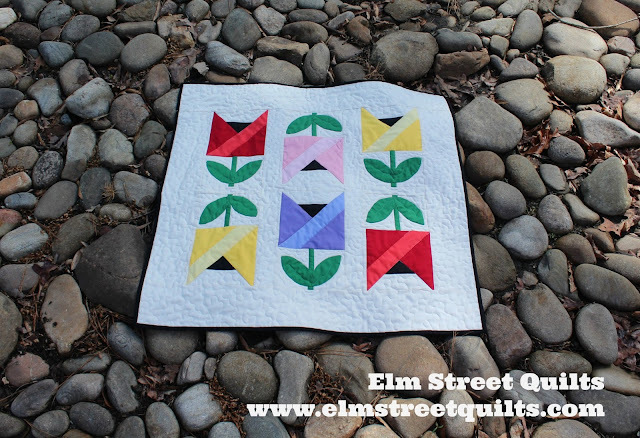 These quilts are so cute! It looks great in both solids and prints. Very pretty! Ooh I like how you kept the square corners! Nice graphic effect! I think lupine might be my favorite spring flower, but they are all so lovely, aren't they? 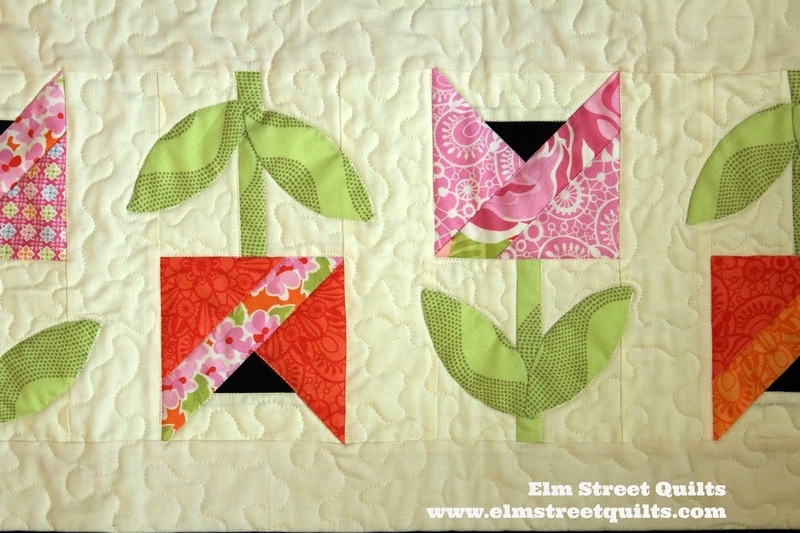 The mini quilts look wonderful, and I agree with Lorna that the tulips look great whether in prints or solids. 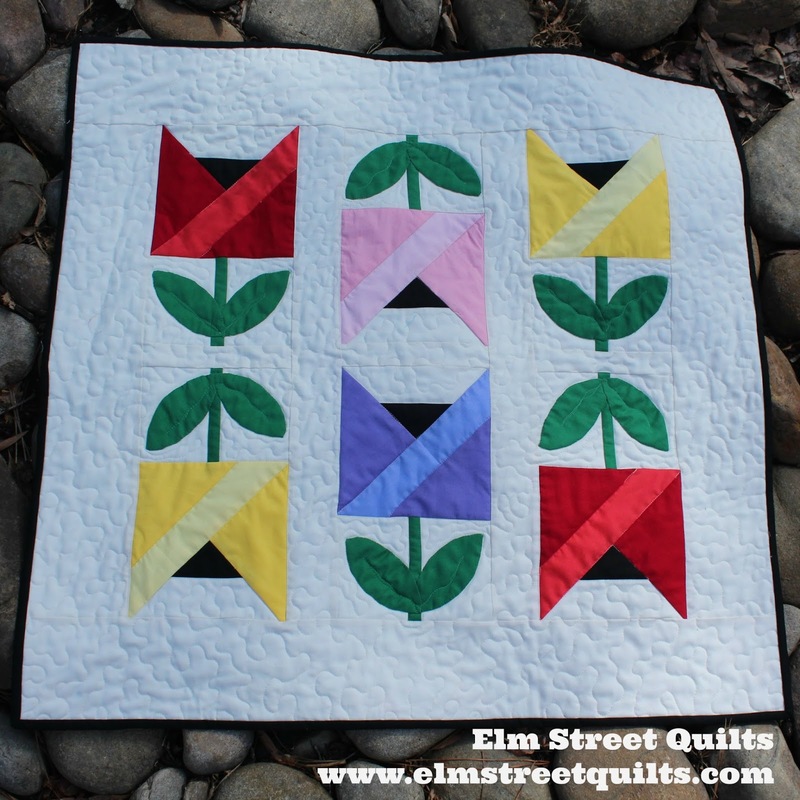 Very pretty tulip quilts! I love the solid fabrics you put together as much as the Kate Spain fabrics! I like the solid fabrics just as much the prints. They are both really pretty! I like tulips. I like your tulips quilt! Very pretty! A perfect mini for early spring. Your tulips are adorable! They are my favorite spring flower as well. Love those Dutch Tulips. Tulips are my favorite spring flower. Is that pattern paper pieced or regular pieced? You did a beautiful job.